With the full performance script and a wealth of materials for producing, teaching, and using the play to build community, The Panza Monologues reveals important truths about women and body image, as well as Chicana cultural production and its material realities. The Panza Monologues is an original solo performance piece based on women's stories about their panzas—tú sabes—that roll of belly we all try to hide. 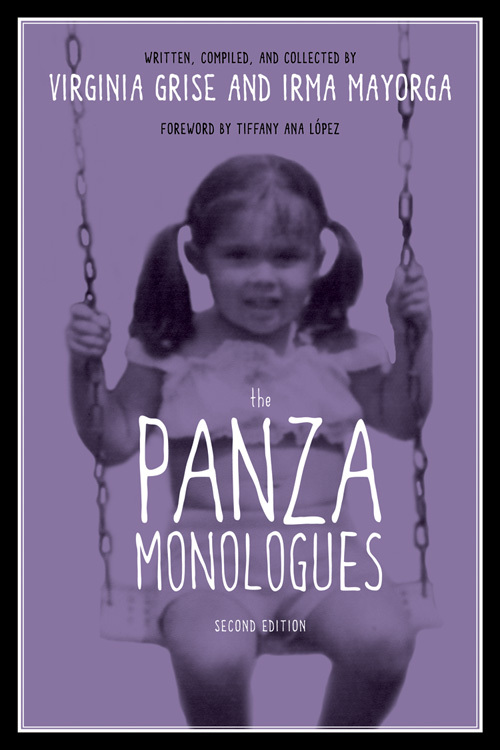 Written, compiled, and collected by Virginia Grise and Irma Mayorga and fashioned into a tour-de-force solo performance, The Panza Monologues features the words of Chicanas speaking with humor and candor. Their stories boldly place the panza front and center as a symbol that reveals the lurking truths about women's thoughts, lives, loves, abuses, and living conditions. This second edition of The Panza Monologues presents the performance script in its entirety, as well as a rich supporting cast of dramaturgical and pedagogical materials. These include a narrative history of the play’s development by the playwrights; critical materials that enhance and expand upon the script’s themes and ideas (a short introduction to San Antonio, where the play was developed; playwright autogeographies; and a manifesto on women of color making theater); and a selection of pedagogical and creative ideas, including guidelines and advice for staging a production of the play and for teaching it in the classroom, community-making activities (screenings, hosting “Panza Parties,” community/group discussions), and creative writing activities connected to the play. Tejana, San Antonio native, and Army brat, Irma Mayorga is a scholar and award-winning playwright, whose work in theater also includes directing and dramaturgy. She is Assistant Professor of Theater at Dartmouth College and has also served as a cultural worker in numerous people of color arts and community organizations. A creative writer and actor, Virginia Grise is a member of the Women’s Project Playwrights’ Lab and a recipient of the Princess Grace Award in Theatre Directing and the Playwrights’ Center’s Jerome Fellowship. Her play blu received the Yale Drama Series Award and was published by Yale University Press. Her other plays include Making Myth, Cuerpo Descubierto, rasgos asiaticos, and a farm for meme.